Birth of James Wright registered December quarter 1889 at Dudley. 3 Bourne Street, Woodsetton, Staffordshire. Harry Wright (33, Coal Miner – Hewer, born Sedgley), his wife Rebecca (37, born Sedgley), and their 4 children: James (11, born Sedgley), George (8, born Sedgley), Ruth (5, born Sedgley), and Harry (11 months, born Sedgley). 5 Bourne Street, Woodsetton, Staffordshire. Rebecca Wright (49, Widow, born Coseley), and her 4 children: James (21, Pot Maker, born Hurst Hill), George (18, Pot Maker, born Woodsetton), Ruth (15, Screw Knicker, born Woodsetton), and Henry (10, born Woodsetton). James’s gravestone was inscribed with the words “Ever in the thoughts of those at home”. This was at a cost of 8/9d (eight shillings and nine pence). For the first 2 weeks of July 1917, the 7th South Staffs were in training at ‘O’ Camp at La Commune, between Ypres and Poperinghe. On 15th July they took over a section of front line trench about a mile north of Ypres, temporarilly under the command of the 51st (Highland) Division. The War Diary reports that their line ran from Finch Street on the right to Clarke Street on the left, this appears to be centred about Buffs Road running east from La Belle Alliance CWGC Cemetery, at a distance of about 400 yards from the cemetery. On the 16th and 17th July the Germans sent over some gas shells which did not seem to be too troublesome; still 2 men were killed during these 2 days. The War Diary for 18th July 1917 reports: “Enemy artillery more active. One shell fell amongst a working party at HILLTOP and killed or wounded 13.” 3 men from the 7th South Staffs were killed on that day, most likley in that working party. 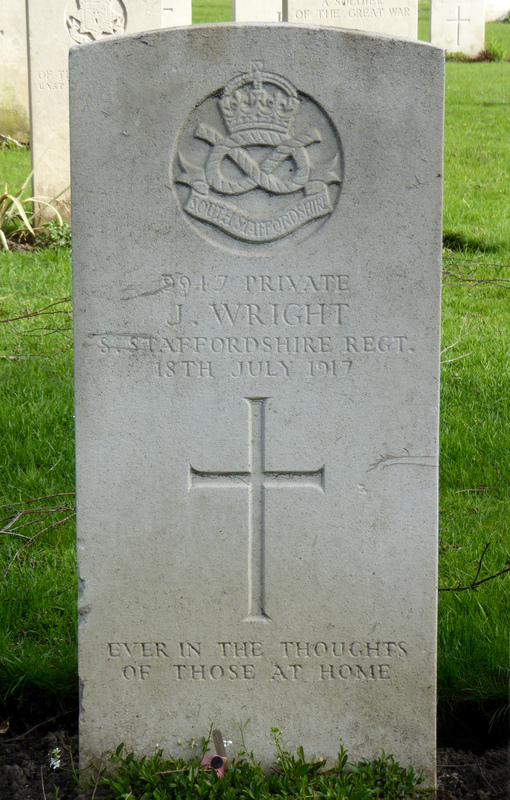 James Wright was one of the 3 men killed, he is buried in La Brique No. 2 Military Cemetery which is about 800 yards south of Hill Top where he was killed.